The resignation of Pakistani President Pervez Musharraf is a sign of how the "war on terror" is changing. Mr Musharraf was once the lynchpin of Pakistan's alliance with the United States in President George Bush's war, but the days of a single strongman laying down and executing the policy are gone. Instead, a longer-term reliance on the emergence of democratic institutions to offer an alternative to extremism is taking place. This partly explains why for the US and Britain, the departure of their former ally matters less than it once would have. His time came and went. In the immediate aftermath of 9/11, President Bush drew up battle lines and President Musharraf stepped forward to take his place in the front line. But today, al-Qaeda is seen as a weakened organisation, on the defensive in Iraq and unable to regroup in Afghanistan, while retaining its ambition and potential to cause real damage. In such a situation, there is less need for battle cries against extremism - and more of a need for the building of representative governments - as in Iraq and now in Pakistan. The "war on terror" is proving to be a generational struggle, similar perhaps to the Cold War, which saw communism in power across Russia, half of Europe and China for 50 years before it collapsed or significantly changed. During that time, the Western democracies adopted a twin track approach - maintaining strong military power while developing a responsive form of government. The same tactics are coming to prominence as the "war on terror" progresses. (Update: Foreign Policy magazine in the US has coincidentally published its fourth annual "terrorism index" and of more than 100 terrorism experts surveyed "more than half... name Pakistan as the country most likely to become the next al Qaeda stronghold. That's up from 35 percent last year. In addition, a large majority (69 percent) of the experts considers Pakistan the country most likely to transfer nuclear technology to terrorists." So obviously there are deep concerns. In Mr Musharraf's place comes a civilian leadership, albeit in an unstable coalition government whose future is uncertain and whose ability to combat the extremism in the tribal areas is untested. Nobody yet knows who will be the next president. But the coalition was the product of elections, not a coup, and therefore is now being projected by Washington and London as a surer basis for future action than the weakened Musharraf. It is from the tribal areas, the US and Britain say, that Taleban fighters cross into Afghanistan where they present a real danger to Nato forces supporting the Afghan President, Hamid Karzai. This link provides a major incentive for the US and UK to follow and - and try to influence - events in Pakistan so closely. A great deal also depends, as always in Pakistan, on the military. 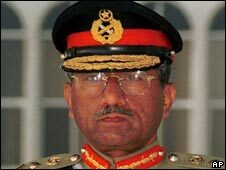 The army chief, General Ashfaq Kayani, has moved to align himself with the civilian leadership and not long ago reassigned some senior commanders appointed by Mr Musharraf as a signal of his intentions. But the army still faces a huge task in the border regions. Pakistan remains therefore at the heart of a region of concern for much of the world. Alarming predictions that a nuclear-armed Pakistan would fall into the hand of Islamic fundamentalists, however, have not materialised.